Source: Iowa County Cemetery Stones & History 1844-1975, compiled by Pauline Lillie for the Iowa County Historical Society Bicentennial, 1976. Approximately 102 burials listed in her publication. I found this at the Iowa County Genealogical Society. Location of Titler: Marengo Township 81, Range 11, Section 13. History: Ms. Lillie describes this cemetery as one of the earlist with first burials in 1851. Families may also be found in the Bishop (Denzler) Cemetery to the east and the Athey Cemetery to the west. Ms. Lillie's publication mistakes Phebe Allgood for a Spracklin and doesn't have Elizabeth Spracklen listed at all. There is another publication done by a Ms. Sanchez that my cousin found at the Iowa Genealogical Society (not to be confused with Iowa County Genealogical Society). This is the state society located in Des Moines, Iowa. Source: Cemeteries Marengo, Iowa County, Iowa, Originally transcribed by Mrs. Kaye Sanches and finished in 1968, Des Moines, Iowa, retyped by Marion A. Gunderson 2001. Mrs. Sanchez writes that there are 21 unmarked graves and stones were piled against the trees, some broken. Approximately 83 burials listed in this publication. There are discrepancies between the two publications and my suggestion is to consult both of these publications and then study my photos of the tombstones in the next posts. I have personally walked this cemetery in April/May of 2003 and taken photos. So I know that there are tombstones in that cemetery that Ms. Lillie did not record. Always check the date of a cemetery transcription so you can get an understanding of the time frame involved. The older the transcription publication the better chance of finding tombstones of older vintage. After the date of publication if the cemetery is still operational you will get new burials, of course. 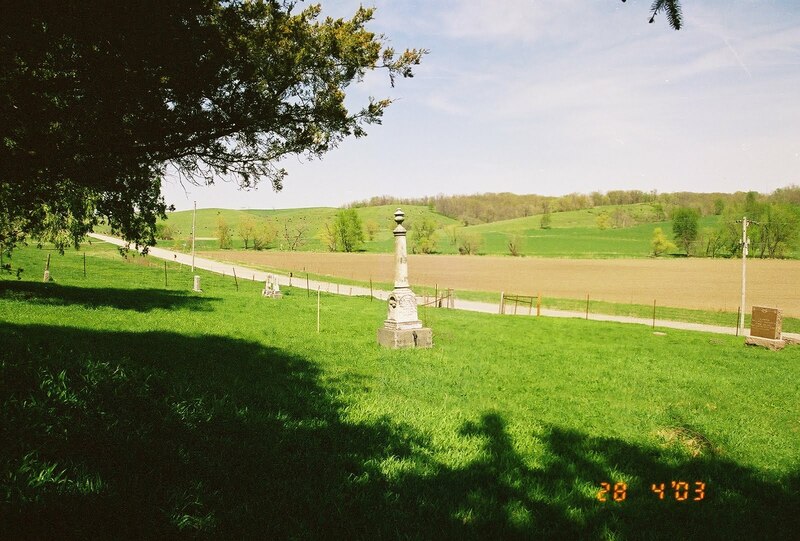 Photo: Titler Cemetery looking north toward the highway and Blairstown, April 2003. 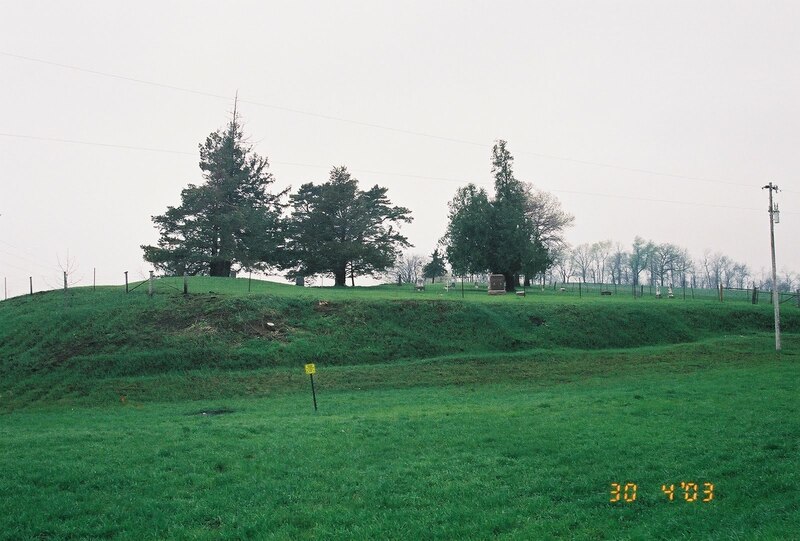 Let’s get started with a little cemetery I visited in Iowa back in April of 2003. It is the called the Titler Cemetery and it is 1 mile northwest of Marengo just as you turn north to travel to Blairstown. Marengo is located in Iowa Co., Iowa. Back in 2003 I found the Titler cemetery was maintained but some of the stones were broken and bunched around the trees, apparently so they could mow it regularly. This was unfortunate for it meant that some of the stones were not matched with the graves. As you walked around the cemetery you could easily stumble because there were depressions in the ground. These were the graves with their tombstones missing. According to the Iowa County Genealogical Society the plate map is missing. This website of Satellite views was not available in 2003 so enjoy for it pinpoints where the Titler Cemetery is located. Directions: Take Eastern Ave. through Marengo and drive north across the bridge over the Iowa river and turn left at the end of the bridge and drive along Co. Hwy F15. When the highway starts to turn north you will find a knoll where the Titler Cemetery is on the west side of the road, there is a wire fence and a gate. I parked on the road to the side and walked up. My cousin drove his car up to the gate and through without a problem the next day. He was certainly braver than me. In the photo the gate is to the right and is not shown. Over the years I have traveled around the United States researching my family and seeking out the ancestors of my clients. As I have traveled to various locations around this amazing country I have taken photographs of cemeteries and tombstones. They need to be shared. Hopefully it will help someone else in their quest for family. I am not an expert on cemeteries or tombstones but I am enthusiastic. I have learned a few things about researching cemeteries and had some interesting adventures which I will share. I don't have complete cemeteries and a formal documentation, still, I think it will be of value. Let's get started and have some fun!